Dry Run Creek for Kids & the Handicapped. Trout fishing at its best. "The best 1/4 mile of trout fishing in the world"
"The Jewel of Trout Streams"
Here is a new one "The Spoiler". As the saying goes, "spare the rod and spoil the child"...we think not. It is more like "use the rod, and spoil the child". A Fly Rod of course. We are speaking of Dry Run Creek, a 3/4 miles of spring and hatchery effluent fed water that benefits from the cold oxygenated water that comes from around 150' below the surface of Lake Norfork. It is then oxygenated and pumped into the 50 runs in the worlds largest cold water fish hatchery. The hatchery supplies enriched food to the growing trout that remain in the concrete runs until they reach a length required by game and fish managers. Typically that size is 6" for Cutthroat and Browns, and, 11" for Rainbows. Not that there is a lot of food that goes to waste in these runs, but what is left flows out of the hatchery and into the creek that is adjacent to the hatchery. This creek has its own food source. Sow bugs, scuds, worms, grasshoppers, ants, and eggs. Everything that you would find in the river, but more concentrated. There is no good reason for these fish to leave Dry Run Creek, and some probably don't. Dry Run Creek was closed to fishing for the first 30 years of its existence. In 1988 the Arkansas Game and Fish Commission working with the Federal Fish Wildlife opened the creek for fishing. Licensed Handicap persons and children under 16 years of age could now fish with a single barbless hook and no bait. Ideally, fly fishing with a fly was the modus operandi. The rules are pretty much the same now as they were then, with one exception. Handicap wheel chair bound individuals may fish from the newly built decks and ramps. Just having a Disabled License does not qualify you. The creek is open from sunrise to sunset. Poaching is watched very closely by the AGFC officers. Barbless hooks are also closely monitored. Hint: Mash the barb, pass the hook though the sleeve of your shirt. If it catches, you could be looking at well over a $100 fine. So, what spoils the child? How about 18 to 22 inch fish so thick that you could walk across their backs for the width of the stream, which is about 12 - 15 feet wide. How about a 15 lb rainbow, a 13 lb Cutthroat and 35" Browns. Dry Run Creek is arguably the best place to see and catch a decent Brook. The Grand Slam!! And, your kids are going to catch one before you do. Once those kids reach 16, it's adios. Time for the spoiled kids to grow up and be a man and woman! Fish the big water, wade the tail waters; but, they can still dream and brag about the time they caught what would have been a state or world record trout. Did I mention it is all catch and release? No way anyone will ever know if a record was broken. No way to get to certified scales. Net the fish, wet your hands, take the fly out, pose for a quick photo and now gently release the fish back into the creek. Mom and Dad, trust me, you will have as much fun as your kids. Dads usually take the net and skillfully net that trophy, at least, that is the intent. Some of these fish are like trying to put a 30 inch square block into a 24 inch hole. Lose one of your childs big ones and you might just get an ear full from your 10 year old. Some kids start at the age of 4 or 5 to fish the creek. Best age is probably 8-10 for starters. Believe it or not, they can get bored after an hour of catching. Bored!? When they do, it is best to set the gear aside and let them pick flowers or icicles for a bit. They will usually ask you if they can catch fish again. The first time you take the kids to Dry Run, I strongly encourage you to hire a guide. It is disheartening to the kids to have their dad rig up there rod and reel only to have him put something on the hook that these fish have not seen. While the other kids, with guides, next to them are catching fish on every cast, your trying to teach you child to cast in a confined area, to observe a "take", and to control the line when that fish takes off down stream. While you help him, who will net the fish? Not Mom, she is taking pictures. Get a guide, it will make the trip a pleasant one for all. 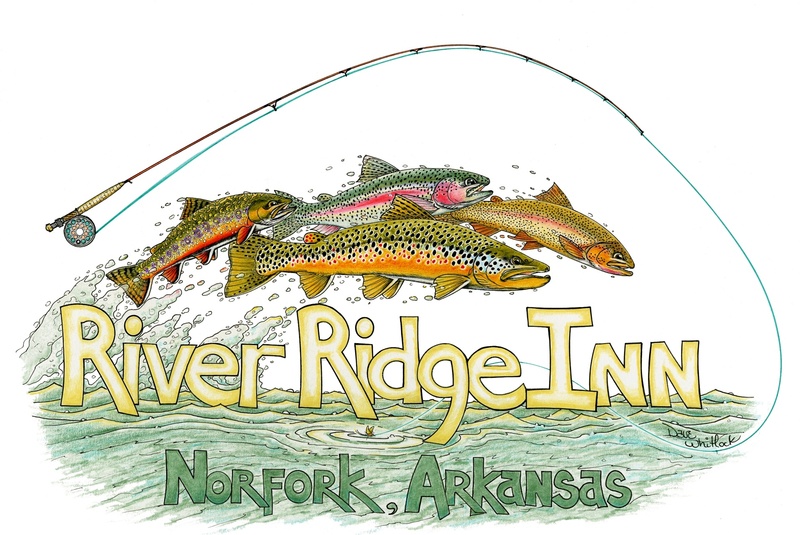 Just call us at River Ridge Inn and we will find the best instructor/guide available. Do it in advance, because these guides are in a high demand in the summertime. I hope this excites you enough to take out the rod and spoil your child. He, or she, deserves it. It will be an experience they will talk about all their lives. And most likely, you too. The creek has other great attributes. The best one is that while the hot August days in Arkansas makes breathing a chore, the canopy covered cold water stream is possibly 15 degrees cooler with a gentle breeze coming from the push of the water exiting the hatchery. Do not miss a tour of the hatchery while you are there. It is truly a great experience and the kids will love the break in action. Ranson Haney, 13 years old caught this magnificant Rainbow with his Dad, in October of 2015. This monster was one of 4 or 5 BIG Trout caught at Dry Run Creek by Ranson and his friends. Good Job! At the beginning of this article, I mentioned "the Grand Slam. Ransom did not only catch the magnificant Rainbow at Dry Run Creek, but take a load of this "Grand Slam"!! Way to go Ranson! Does Dry Run spoil the kids. Of course, but it starts them on the way to learning a sport that will last them, challenge them and reward them for a life time.